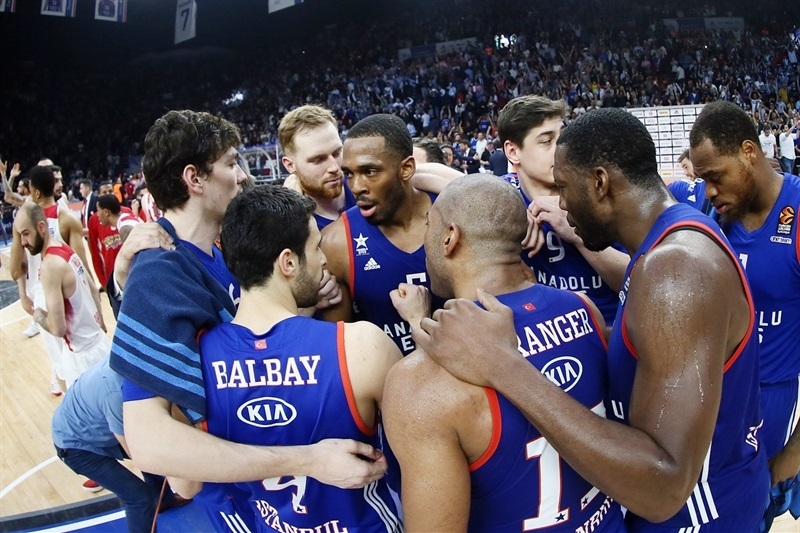 Anadolu Efes Istanbul outlasted Olympiacos Piraeus 64-60 on Wednesday at Abdi Ipekci Arena to take a 2-1 lead in the teams’ best-of-five playoff series. 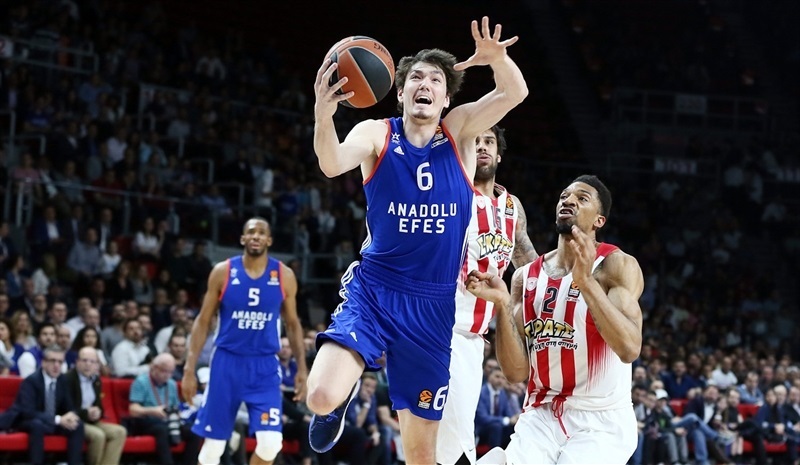 Efes hosts Game 4 on Friday knowing a win will send it to the 2017 Turkish Airlines EuroLeague Final Four at nearby Sinan Erdem Dome in the Turkish metropolis. 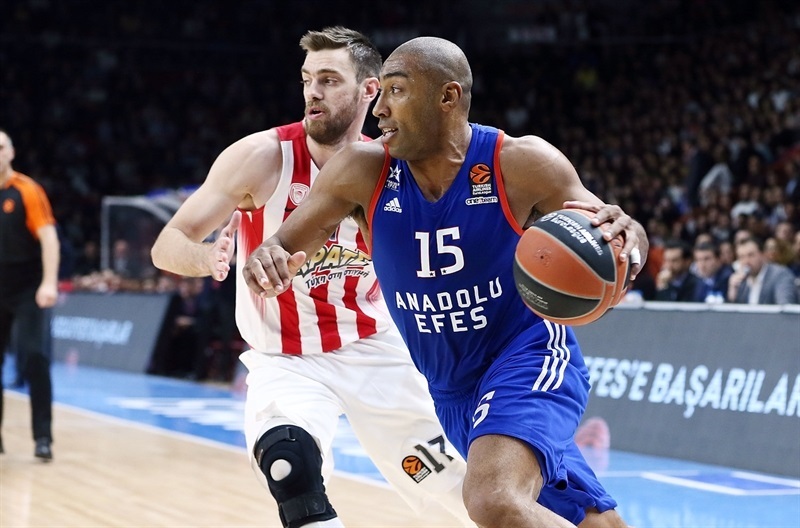 Efes led by as many as 17 in the third quarter, but EuroLeague legend Vassilis Spanoulis erupted late with 3 three-pointers to bring the Reds within 61-60. 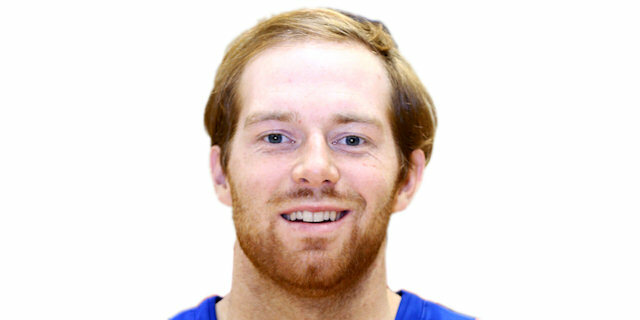 Free throws by Thomas Heurtel and Tyler Honeycutt helped Efes hold on and get in position to reach its first Final Four in a decade and a half. Bryant Dunston led the winners with 16 points and 9 rebounds, Heurtel tallied 13 points and 6 assists, Derrick Brown scored 12, Jayson Granger 11 and Honeycutt chipped in everywhere with 6 points, 7 boards and 4 steals. Efes struggled with its outside shooting and made just 2 of 18 three-pointers (11.1%) as well as only half of its 16 free throws, but committed just 4 turnovers to make up that gap. 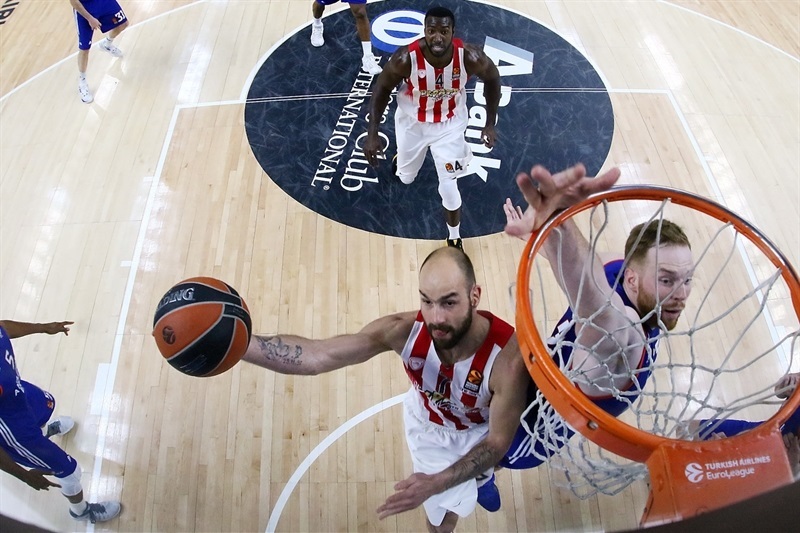 Spanoulis recorded 9 points and 3 assists in the final six minutes to lead the comeback and finished with 15 points, 7 assists and 3 steals, but also committed 7 of his team’s 17 turnovers. Granger opened the scoring for the hosts, but Khem Birch made an early impact with hustle plays on defense. Three and a half minutes passed before Olympiacos scored a basket, but Vangelis Mantzaris’s triple closed the gap to 8-6 at the first timeout. And Kostas Papanikolaou soon tied it at 9-9 with a catch-and-shoot three from the wing. 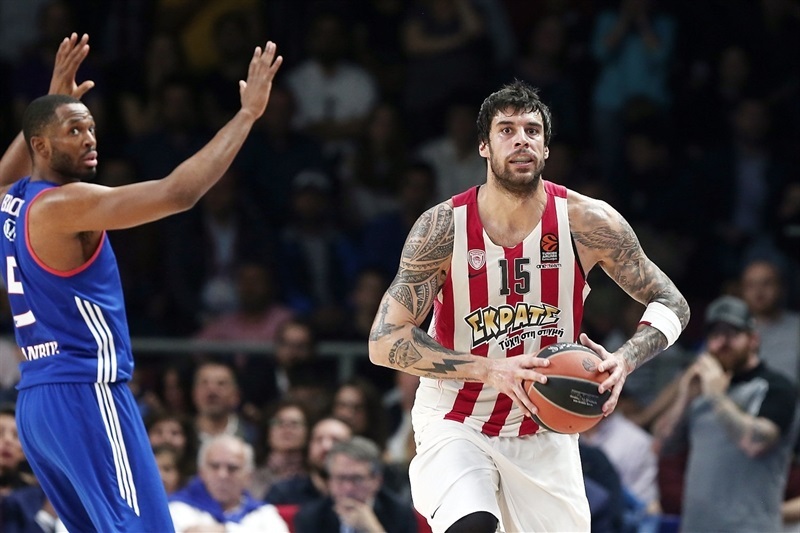 Brown’s third jumper put the hosts back in front, however Spanoulis’s first basket was followed by Georgios Printezis free throws to give the visitors their first lead, 11-13. The lead went back and forth before Printezis added 2 more from the line for a 14-17 lead after 10 minutes. 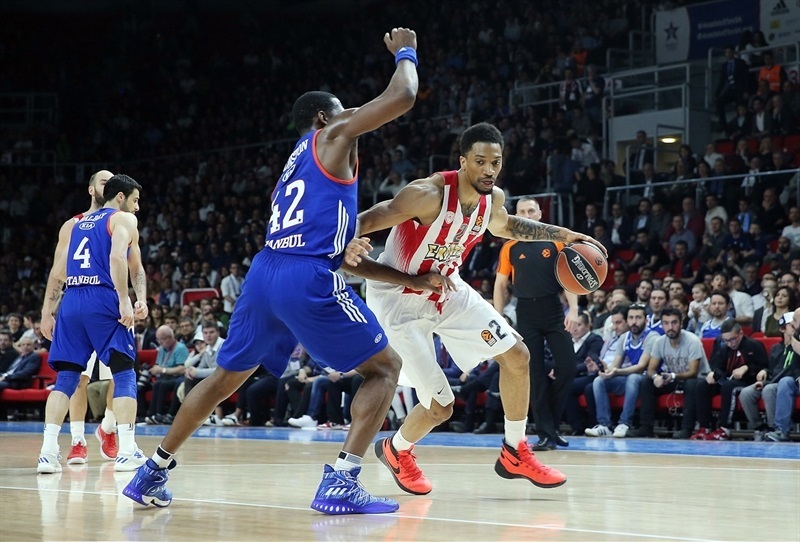 Efes players combined to miss 4 free throws in the first two minutes of the second quarter and Olympiacos went ahead 15-20 when Erick Green split free throws. Efes kept it close and went back in front on Dunston’s put-back basket-plus-foul that made it 27-25. The hosts took charge in the closing minutes of the half with dunks by Brown and Dunston to lead 33-27 at the break. 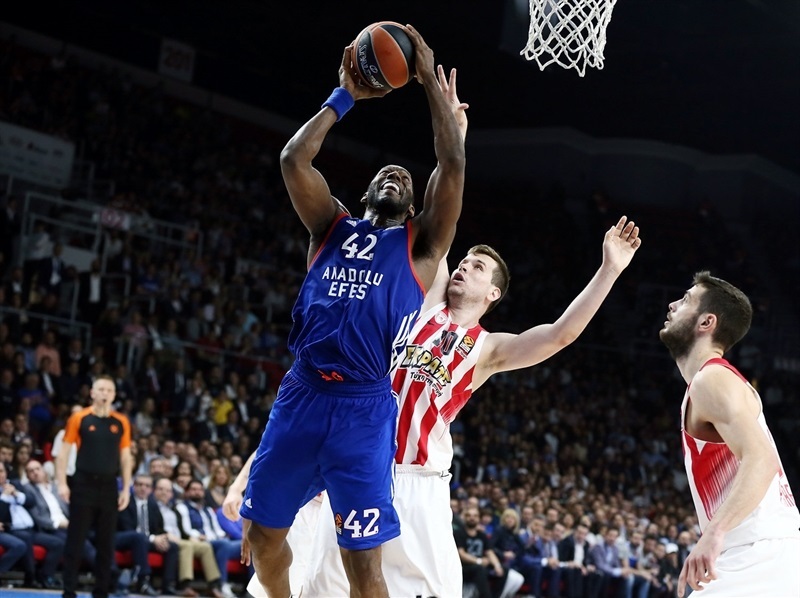 Dunston kept the Efes momentum going with a pair of buckets sandwiched around a block to start the second half and give Efes a double-digit margin. Brown capped a fast break with a fantastic slam that capped an 8-0 run to start the half – and a 14-0 Efes run spanning the two halves to lead 41-27. 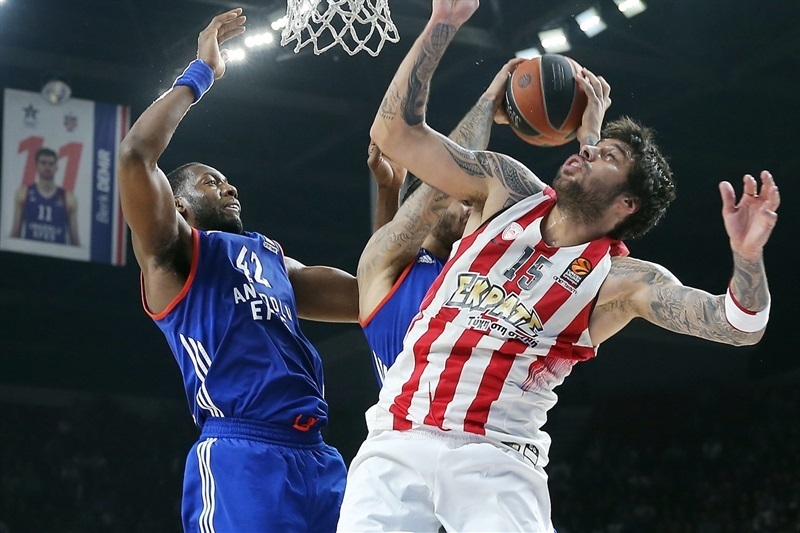 Olympiacos got its first basket of the second half on a Papanikolaou triple, but the lead continued to swell and reached 17 on a Brown jumper. 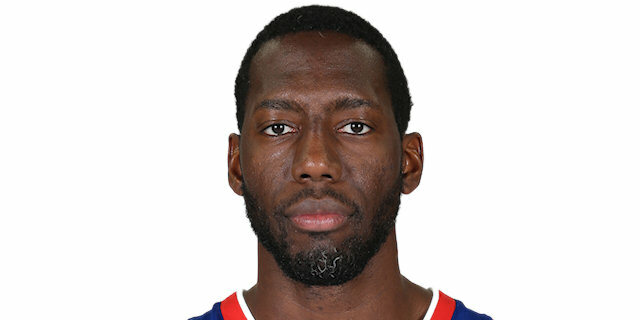 Green and Patric Young narrowed the gap to 51-37 at the end of the quarter. 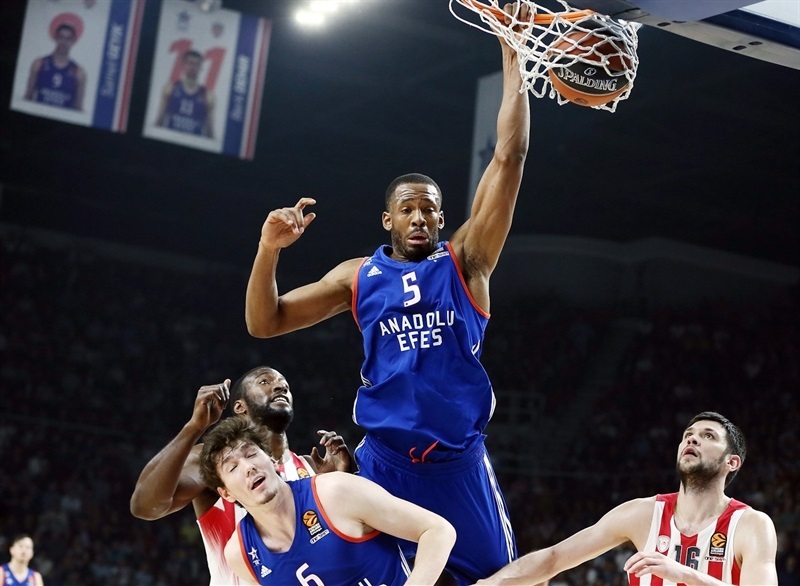 A three by Mantzaris gave the visitors hope, however Dunston scored inside to keep Efes cruising. Brown and Papanikolaou were assessed unsportsmanlike fouls after some shoving. 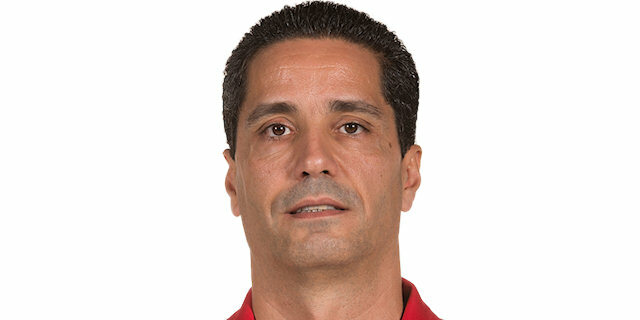 The Reds did not quit and 5 quick points from Ioannis Papapetrou drew the visitors within 53-45. When Papapetrou missed, Printezis tipped in the miss and then scored on the break to make it a 4-point game. 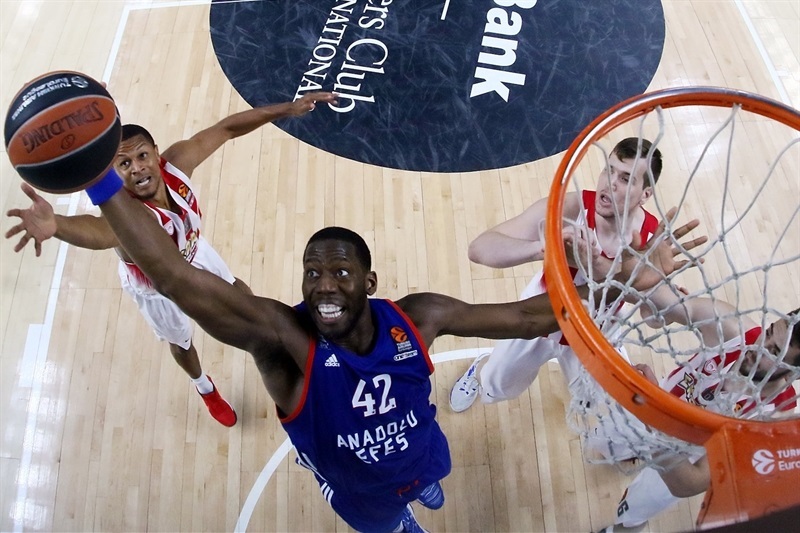 Efes regained its composure through a Dunston dunk and Granger free throws that made it 57-49, but Spanoulis nailed a three-pointer and whipped a pass inside to Birch for a dunk and foul that brought the Reds within 3. 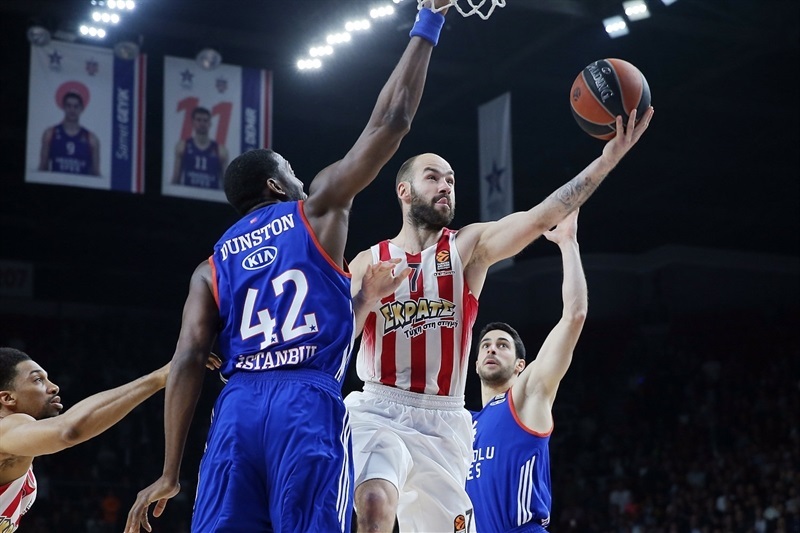 Spanoulis continued to betted the Efes attack with three-pointers to get within 61-60 with 30 second left. Heurtel made it a 3-point game with free throws with 16.1 seconds on the clock. And after Spanoulis missed his next tough shot, Honeycutt iced the game from the line. "I think we played very good for 30 minutes, but in the end of the game, we were a little scared to win it. And the great Spanoulis brought the game to a difficult moment. But I think we deserved the victory, because the whole game we were better. It's difficult to keep Spanoulis to 2 or 3 points. We know he'll always take important shots, but he scored amazing shots at the end… It is not easy playing against Olympiacos. They are a great team. They don’t play these tight game. I am happy about the victory, but also I know that the next game will be even more difficult, if that’s possible. " 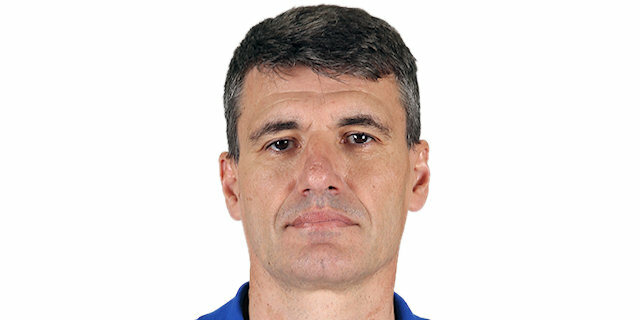 "I want to congratulate Efes for this win. I believe that today we lost the game because of our offense. We didn’t make good decisions on offense; we didn’t read the defense well and until the 30th minute we were very passive and we didn’t move the ball a lot. When you play away and you keep the home team to 64 points, if you are a little better on offense you have chances to win the game. Unfortunately we didn’t have good production and we had 18 turnovers. This is a very big number for an away game and a lot of these turnovers were unforced, because of a lack of concentration. At the end we tried to come back and we had our chances, but one defensive rebound, one easy basket for Efes, one missed fast break from our side didn’t give us the chance to steal this game. 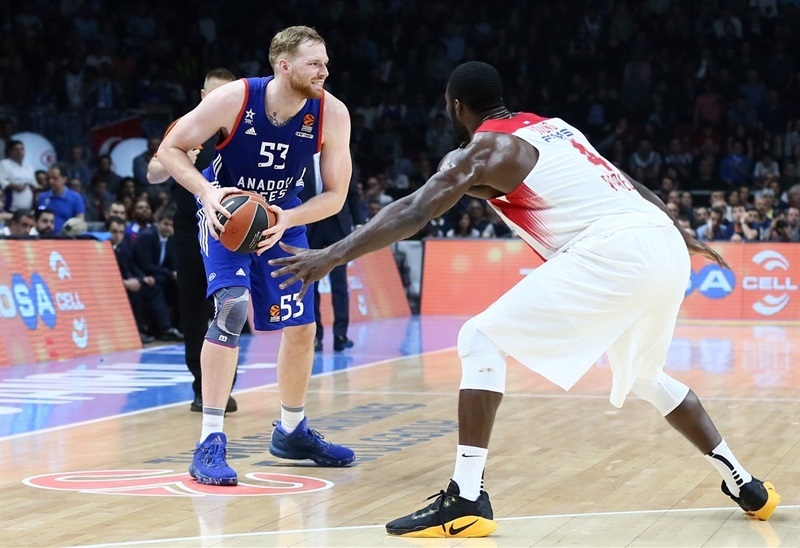 Efes now has the advantage 2-1; they need one win to go to the Final Four and we will try to fight for our chances in the next game. " "This is a tough EuroLeague team. This is my first experience in the EuroLeague playoffs, but coming in I knew it was going to be tough. The team played incredibly hard tonight and incredibly aggressive on defense. That gave us the win today. I think our defense was really, really good today. We moved the ball on offense. They adjusted too on defense and made it tough on us. I know the coaches will look and we will see what adjustments we can make and what we can do next game. " "I think we did a good job on the rebounds and defensively. They only scored 60 points. I think that's the best we've done defensively in the EuroLeague. But we knew that they were going to come back. You know, they have a history of fighting back. They're a great team and we've got to improve on that next game. When we have a big lead, we have to finish them off. [Just 5 turnovers for the game] that's very important for us. We like to play fast, but Coach always tells us we have to play under control, so I think we did a good job with that today."